Camden Stonebridge apartments feature luxury one and two bedroom apartments with the best location in West Houston. Our pet-friendly apartments are perfectly located between Beltway 8 and Gessner Rd, right in the heart of the Westchase District. Enjoy easy commutes to Downtown Houston and the Galleria via Westpark Tollway, Beltway 8, US-59, I-10 and Westheimer. At Camden Stonebridge, you will escape the hassle of big city life without losing the convenience. Our boutique apartment community is small, stylish, and a truly relaxing place to live. Grill with your friends in one of the outdoor dining areas, get in shape in the 24-hour fitness center, or just unwind in the resort-style pool with Wi-Fi. When it’s time to leave the community, public transportation is within walking distance and you’ll have easy access to shopping and dining at the Galleria and Memorial City Mall. Each apartment home is designed for luxury living with features like black appliances, espresso cabinetry, wood-style flooring, garden tubs and large walk-in closets. Enjoy the convenience of having a washer and dryer inside your apartment, as well as cable, and at-your-door trash pick-up services. Detached garages and covered parking are also available. Residents receive a technology package included in the total monthly rent with a savings of up to 51% off retail. This money-saving package includes high-speed internet up to 150 Mbps and over 140 digital video channels through Xfinity. Use the Xfinity Go app on your smartphone or tablet to access your digital video anywhere! See yourself living in the best West Houston apartments? We do! On the weekends you’ll love living minutes from all the eclectic dining and entertainment options Westheimer has to offer, as well as the outdoor hiking and biking at Memorial Park. You’ll also live near where you work with hundreds of great employers like Schlumberger, BMC Software and National Oilwell Varco, all in the surrounding area. Come home to Camden Stonebridge. You deserve it! Interested in Houston's best 55+ apartment community located just minutes from Camden Stonebridge? Check out our sister community, Camden Royal Oaks! We'll save a spot for you! We offer one parking space per leaseholder. 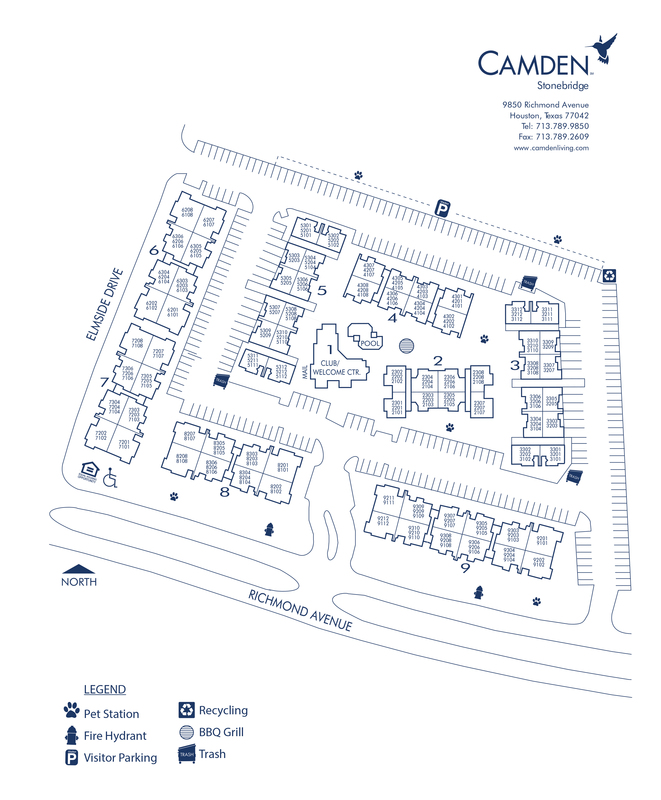 We have ample open parking for our residents and a designated area for visitors on a first-come, first-served basis. Garages are available to rent! Detached garages are $85 per month and carports are available for $35 per month.